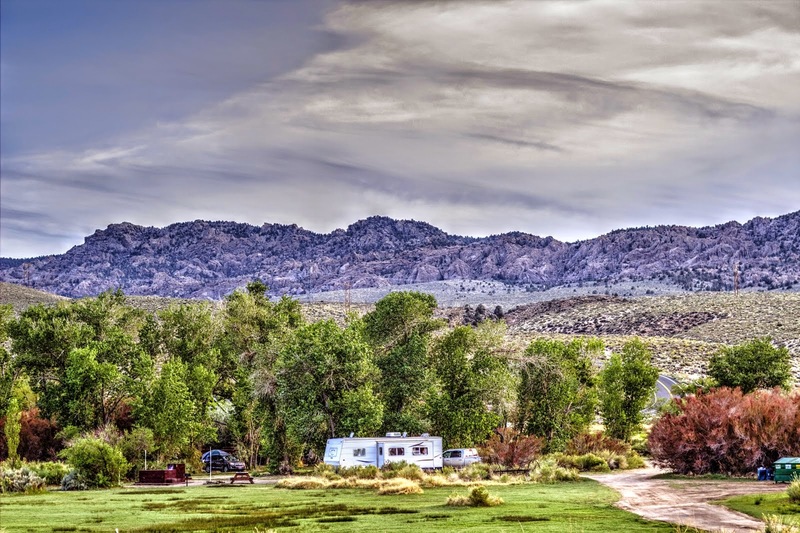 A rustic oasis in Benton, California, about 40 miles southeast of Mono Lake, Benton Hot Springs offers nine spots for campers and RVs, as well as a bed and breakfast. This place is absolutely gorgeous. My idea of paradise. Not fancy (for camping - I didn't see the B&B part), but lovely and very peaceful. Each site comes with a fire ring, a picnic table, a private hot tub and a gorgeous view of the nearby Sierras. They drain and scrub the hot tub after each check-out, so we arrived to our tub filling with beautifully clear natural hot spring water. There's nothing like soaking under the stars in your birthday suit. Each site has quite a bit of privacy, so if you're shy, this is the place for you. The water comes out of the ground at approximately 135° F (57° C). If you want to cool it down a bit, just turn off the spout. There is a small grocery nearby but not much else, so bring your water and supplies with you into Benton. But even if you don't need anything, I would recommend paying a visit to the store, just to pick up some cheetos and a diet coke. And the local paper. The people who run it had lots of interesting stories about the area and they were raising baby chicks in front when we stopped by. A must visit. Disclaimer: As always, my husband's photographs are more beautiful than real life could ever be. $40-$50 per night for two people. Spring and autumn are the best times to go. Reservations are recommended. No hook-ups. To accurately duplicate the Cait experience in Benton, I recommend reading Pontoon by Garrison Keillor while you are here. It is part of the Lake Wobegone series, but you don't have to have read any of the others for this to be a delight. Just find a nice shady spot and a cool beverage, and dig in. It's a fast read -- funny, touching and utterly charming in that self-effacing mid-western way. Keillor is brilliant at revealing the sweetness and beauty of small town life while at the same time skewering its rigidity and petty tyranny. The feel of this book is a perfect compliment to the surroundings here and I have nothing but praise for both. Your own private hot tub. That would really be something to experience. But the price is a little steep for us retired folks. I still put it on my list though. Mono lake I really want to visit.